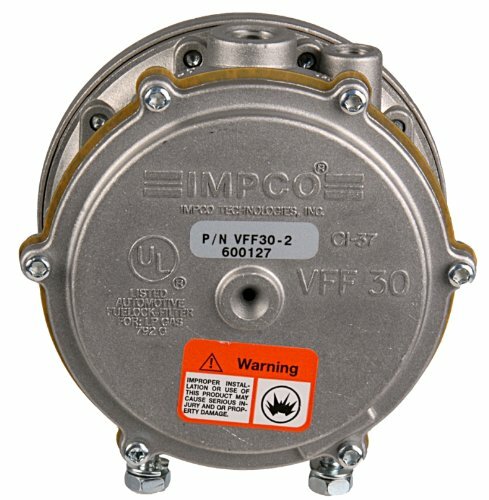 The IMPCO VFF30 fuel lock is a combination fuel lockoff and filter, has a hydrin diaphragm to resist oil, fuel, and solvents, and is suitable for use with liquid propane gas (LPG) or natural gas vapor (NGV) forklift engines with up to 325 horse power (HP) at maximum working pressure of 312 pounds per square inch. The filter element is serviceable with a RK-VFF30 hydrin or RK-VFF30-2 silicone repair kit. A pressure of 0.5" water column (w.c.) is required to open the lockoff. Tools for assembly are sold separately. If you have any questions about this product by Impco, contact us by completing and submitting the form below. If you are looking for a specif part number, please include it with your message.